Uglyworld #235 - Ugly Xmas Tradition Of The Cookie Queue, originally uploaded by www.bazpics.com. Tonight we were treated to what Babo referred to as "a really, really, really important tradition in the history of Uglydolls". On the night of 23rd of December once all of the smaller uglies are already in bed fast asleep the big uglies all get together to recreate the historical act known as the "Cookie Queue". I asked Babo what they needed to make it happen and what all was involved, Babo took me to the side and whispered, "Can you bring us some cookies? In all of the excitement I forgot to get them today!". I told him I could arrange this no problem if he told me a little more about the ancient ritual they were going to re-enact. 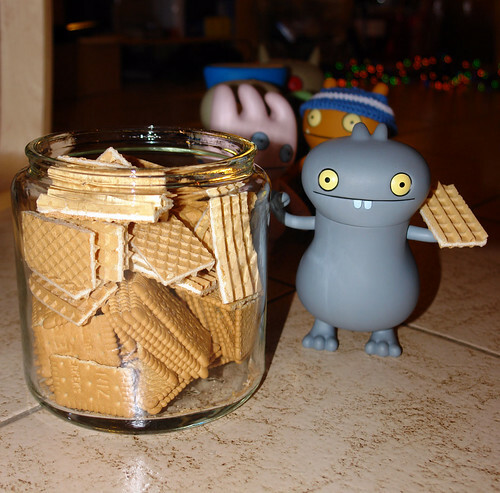 Babo explained that it was the way that the uglies grow from being little to big - that as the clock changes from 23:59 to 00:00 on the 23rd/24th December all the big uglies must be queued up and ready to take a cookie from the jar one by one until they all hold one in their hand at which point they all must eat them together. I asked Babo what would happen if one of them forgot about the ceremony or there were no cookies available, to which he replied "terrible doom, best not to even think of this as we have cookies and all of us are ready". As the clock struck midnight Babo started the procession as they each took a cookie from the jar and then once all were standing ready with cookie in hand they all munched them together. It was akin to watching a wildlife program on the discovery channel with hidden cameras setup to capture the action, really cool!! !